Most people know Thomas Edison for the light bulb, but did you know the famous inventor also held 49 cement patents? 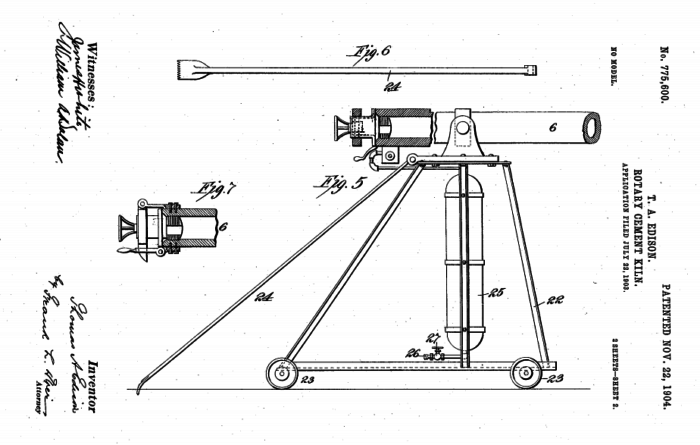 An important part of concrete history, Edison’s patents included cement processing equipment, waterproofing cement paint, and even a mold for single-pour concrete construction. The visionary thinker imagined a future with concrete houses, concrete furniture, and even concrete pianos and refrigerators! Edison developed an interest in cement after noticing the amount of sand waste produced by his ore milling company. He sold the fine sand particles to cement manufacturers for concrete production. In 1899, he created the Edison Portland Cement Company, based in Stewartsville, N.J. Many of Edison’s inventions helped improve the cement production process. His New Jersey cement mill featured the longest rotating kilns in the world. At 150 feet long, these cement kilns were almost twice as long as standard cement kilns. Edison licensed the kilns to other cement manufacturers, which eventually helped his competitors improve their production but hindered his own company’s profitability. Edison believed in concrete’s future capabilities but manufacturing processes had to catch up first. 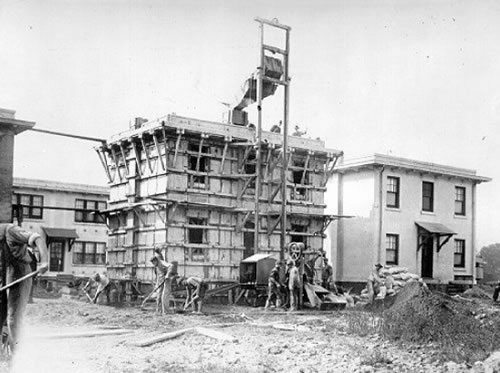 His premature vision of homes that would be both indestructible and affordable enough to help solve the critical housing shortage led to the idea of building houses with a single pour of concrete. His theory: a single-pour process would eliminate the labor involved with erecting walls, adding a roof, and finishing the interior. The homes could also be mass-produced. However, the mold itself, constructed of 2,300 cast iron pieces that could be assembled together and taken apart, was expensive and most homebuilders weren’t eager to spend $175,000 (equal to $2.5 million today) on the mold. Although very few concrete homes were ever poured, a handful still stand today in Phillipsburg and Montclair, New Jersey. Edison’s concrete walls were so durable that they were left untouched when Yankee Stadium was renovated in 1973. 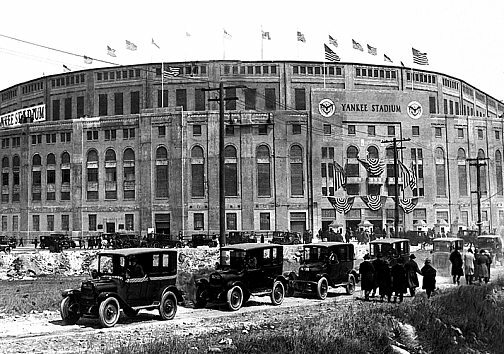 The stadium remained in use until 2008, when the Yankees moved one block north to a new, more spacious stadium. The new Yankee Stadium features many of the same design elements as Edison’s original. Despite the success of Yankee Stadium, the Edison Portland Cement Company folded a few years after its completion, during the Great Depression. But between 1900 and 1919, Edison’s 49 cement patents contributed greatly to the future of concrete.